Available in Infant uk sizes 4 5 6 7 and 8. Touch Fastening stap with T bar. Has a rubber sole and soft inner lining. Great for the Spring Summer with beautiful floral detail. Brand New In Box, Girls T bar White Pink Multi Flower print shoes. 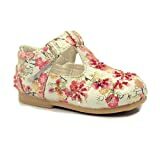 Beautiful shoes made in a flower print upper with pink, gold. There are pink beads added for elegance. Ideal for the spring, summer, parties and weddings. Has a rubber sole to the bottom which is ideal for walking and comfortable. Available in size Infant 4,5,6,7 and 8.